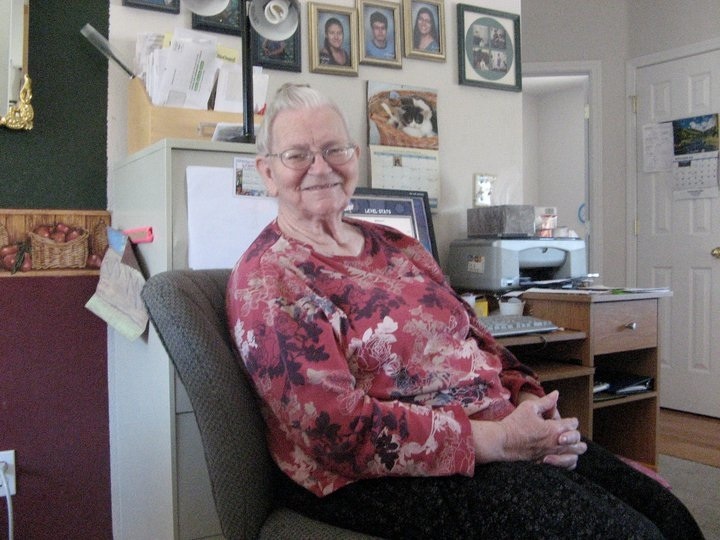 My mom died in January, 2011, two months shy of her 76th birthday. When she passed, there were so many things to get done, so many details to tie down. Settling her estate was just the tip of a very large iceberg. Because we live in Washington and she lived in Idaho, that amplified the time constraints. I had to be back to work. Sooner than I was emotionally ready, but bills have to be paid and corporate America marches on. We packed up all my mom’s belongings into one very large UHaul truck, drove it through a couple of mountain passes in the middle of winter, then put it all into a storage unit. A few months later I had a GIANT shed constructed in my back yard and we moved everything from storage to the shed. My mom, the fabulous V. Ilene, the woman most responsible for who I am. I took this the summer before she died. My cousin had been through the same thing a couple of years prior. Her husband is in the Navy, so they have the threat of mobility to their lives at all times. She did not have the luxury of storing things until she was emotionally ready to face the mountain of boxes. She is the one who encouraged me to wait, to not make any decisions for at least a year. It’s been well over a year and I still don’t know that I’m ready. I’m able to look at some things objectively, like the metric ton of fabric purchased by my mom, but never used for the envisioned quilting project. I’m comfortable with the knowledge that I will never be a quilter. It doesn’t appeal to me in the least. And if that changes and I decide to take up the hobby, then I reckon I’ll buy some fabric when the time comes. The fabric taking up 2/3 of the shed (not even kidding folks), however, is being donated to a local church who makes quilts and donates them to hospitals, the fire department, etc. I feel good about that. My mom would rather I keep it and use it myself, make something useful with it, use the skills she taught me when I was a kid. In lieu of that, though, she would like knowing that it’s being used for something good and not sitting in a shed going to waste. My mom’s filing system was questionable at best. In the middle of a box of fabric, we found my dad’s birth certificate. In the middle of a stack of old newspaper ads, we found his death certificate. The family bible, evidence of a poor family’s existence, was tucked into a box of unused electrical supplies. So, even though there are boxes and boxes and boxes of fabric, there’s no such thing as the safe assumption that what you see on the surface is what you get throughout. In other words, even the most benign boxes have the potential to send me on an emotional ride down memory lane. After watching me watch the shed, but not doing much else with the contents, for over a year, Tara finally stepped in late this summer. Knowing my feelings about the fabric, but unsure about everything else, she set to work sorting through boxes. She’s worked her way through the bulk of the fabric, and come up with some fabulous treasures. For example, my mom’s collection of small pocket knives. There is a very nice one with a pearl handle, but it doesn’t appeal to me as much as the simple brown one with the worn down blade. This is the one she kept in her purse when I was little. I have no idea what she used it for, but I remember it in her hands. Tara found a bag full of buttons and had placed it in the to-be-donated pile. I don’t think she was terribly impressed when I rescued it and put it into the keep pile. When I was little, my mom had a giant coffee can full of buttons. By the time she died, the collection had dwindled to a ziploc baggie. I spent hours upon hours playing with that can of buttons. The differences in patterns and size fascinated me. Still do. And I found the perfect project online the other day. Lily and I will complete it together after school one day this fall. 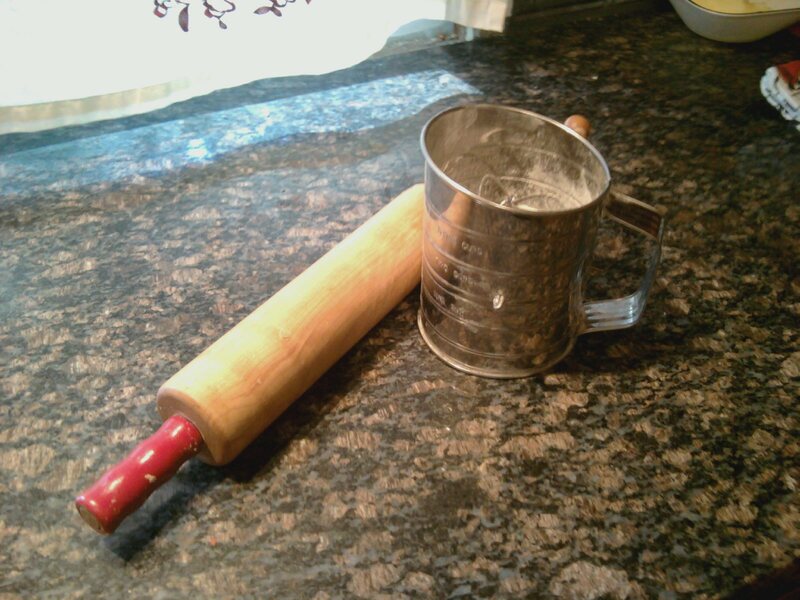 Hands down my favorite thing Tara’s come across so far is my mom’s rolling pin and flour sifter. My mom taught me how to make homemade chicken and noodles when I was Lily’s age. I can remember her rolling out the dough with her rolling pin, a wedding gift she’d received 20 years prior. That rolling pin is at least 50 years old at this point. No idea about the sifter, but I’m guessing it’s from the same era. 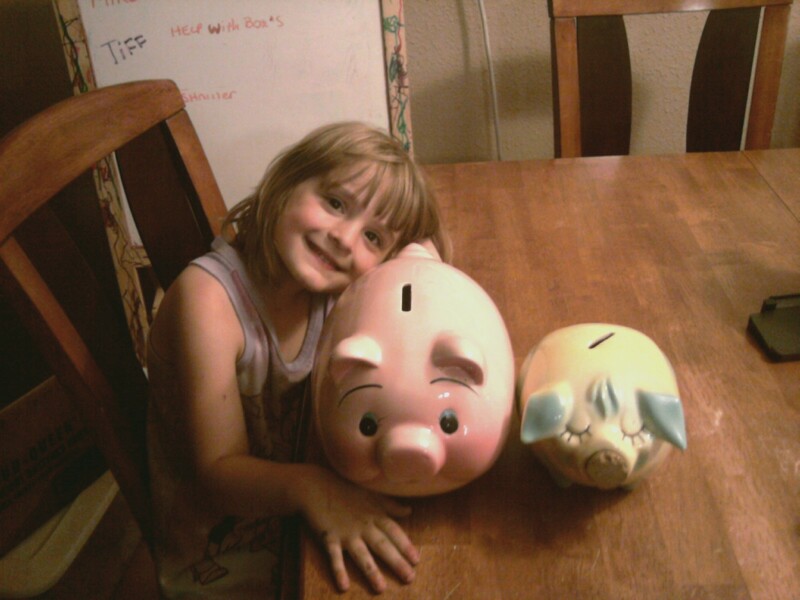 Lily, her pig (my old pig), and my mom’s pig (my new pig). I don’t know if my mom realized how much she was influencing me with her simple actions. I’m sure she didn’t realize how much of it would carry forward to her grandchildren. All she knew was that she was living her life the best she knew how, and that was enough. Thanks, Gwen, she was a fabulous woman.